As you all know by now, Spain has become my favourite hunting ground for images of the natural world. The country is so diverse; mountains, sea, flat lands, wetlands and deserts! In December I will be going to photograph the rutting of the Ibex in the Sierra Nevada. 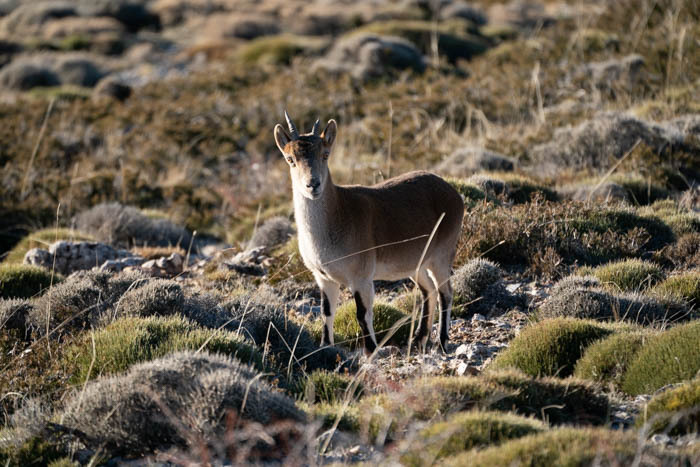 The Sierra Nevada is a mountain range south-west of Granada and a stronghold for the Iberian Ibex. The Ibex is a mountainous animal. Their built allows them to run, jump and reach steep slopes without too much effort. Main advantage is also, that it is difficult for predators to get to them! The males are larger than the females and have larger horns. The rutting takes place in November and December and I am hoping to get nice images of fighting males and nice scenic images of Ibex in the snow covered mountains. I will not be on my own and count myself lucky to spend the week with natural world photographer Ugo Mellone. Ugo is an award wining photographer (WPOTY, National Geographic) and an expert on the Iberian Ibex. 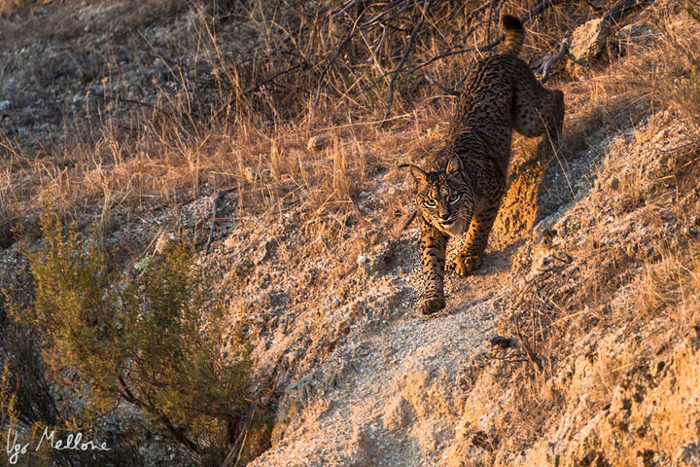 After 3-4 days in the Sierra Nevada we will move to Andujar, in the district of Jaen in Andalusia, to try to photograph one of the most elusive animals in Europe: the Iberian lynx! The Iberian lynx is an endangered species and has declined by over 80% in the last 20 years. Habitat loss and human persecution are the main reasons for the decline. 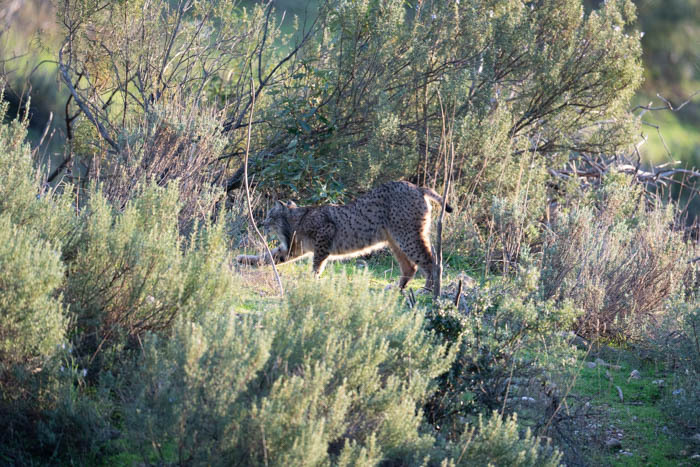 The Iberian lynx is now fully protected and is making a slow comeback. Currently there are around 500 animals in Spain and Andujar is one of the strongholds. Finding and photographing this beautiful predator is not easy but with the help of Ugo, I hope we can manage to get some nice images! The main prey of Lynx is rabbit. Besides the lynx, i hope to photograph Otter, deer, landscapes and night sky (weather permitting). Weather in December should be cold and snow is to be expected. I will be flying to and from Granada. As always:if internet is available ,in the hotels where I am staying, I will update my diary on a daily basis. I hope you will all stop by from time to time to have a read and see how my trip is unfolding. I can’t recall that I have ever been away on a trip in December but there is a first for everything I suppose. 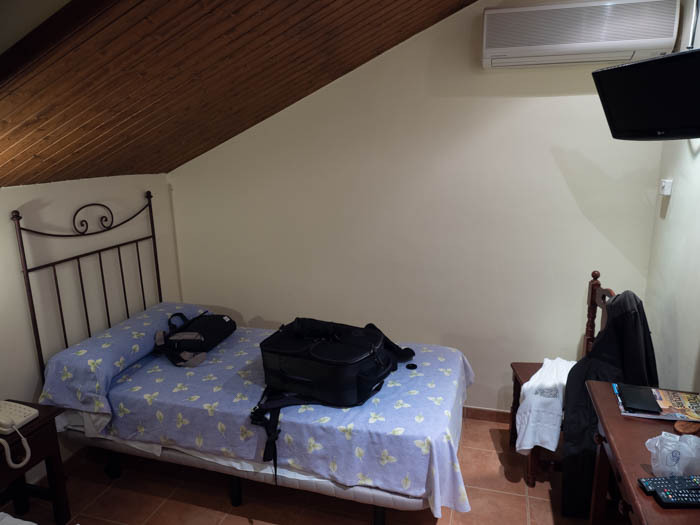 Last week I was in Dubai and Abu Dhabi with my son watching the Grand prix and right now I am sitting in a fairly small hotel room in the mountain village of Monachil in the Sierra Nevada. The hotel looked closed when I arrived, had to call a number and then the front door was opened by the owner. I believe I was the only guest. Restaurant closed and I was put in a room on the top floor! I managed to change that to a more convenient room on the groundfloor! The village is lovely with a little stream running through it and there are (thankfully) a couple of restaurants and a small supermarket. I see a few distant vultures overhead ( I guess Griffon) and a few bats are flying around. Tomorrow an early start. I will meet Ugo, my guide for the week, and we will drive up to the coast for my first encounter with the Ibex. The rutting season is on and I am hoping to photograph battles between the males and interaction with the female Ibex. The weather forecast is perfect. Probably too good! 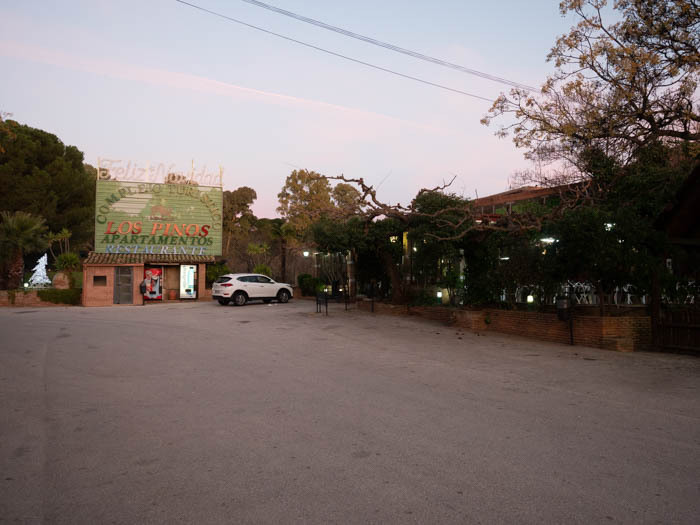 Not the best night sleep but on the road by 06.15 and 15 minutes later I am parked at the BP petrol station, waiting for my guide for the week Ugo Mellone. 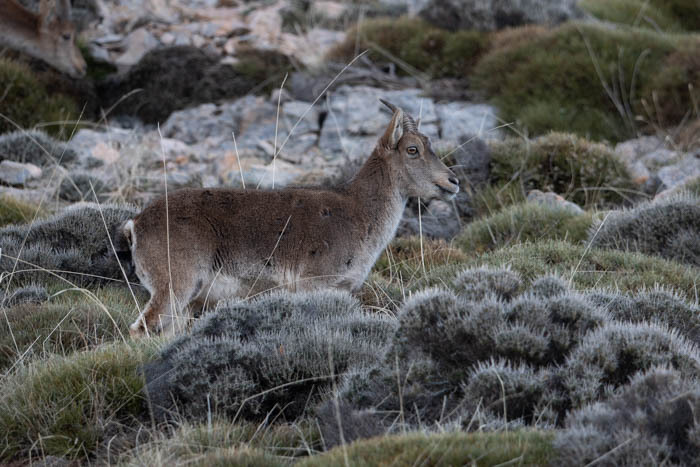 Ugo is a WPOTY price winner and regularly publishes in National Geographic, he is an expert on Ibex and lives locally, so knows all the hotspots for these mountain mammals. Today Ugo suggests we drive to the coast, to a place called Acantilados de Maro-Cerro Gordo. It is a literally a cliff on the edge of the Mediterranean sea. The weather is beautiful. Not a cloud in the sky when we set off for the hour drive. 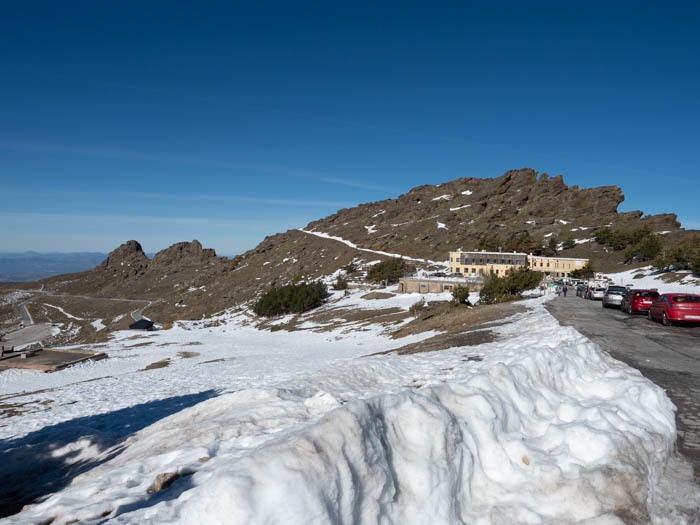 Granada is well positioned for sea and mountains (Sierra Nevada) has a small airport as well and there are direct flight from Gatwick but only once a week in the low season. When we arrive the sun is just rising over the horizon. It is an absolute gorgeous spot and after a 5 minute walk we end up on a spot from where we can overlook the cliff. In the (not so far) distance is the sea resort of Nerja. A place that is close to the heart of my wife and her 3 friends. They went there once a year to soak up the sun and have an enjoyable time! Soon I spot the first Ibex and soon after a couple more. I find it amazing that these mammals can move around on the steep cliffs. There are a few males, young ones and females. If you expect to get frame fillers here, then you will be disappointed! It really is a place for nice scenic images. 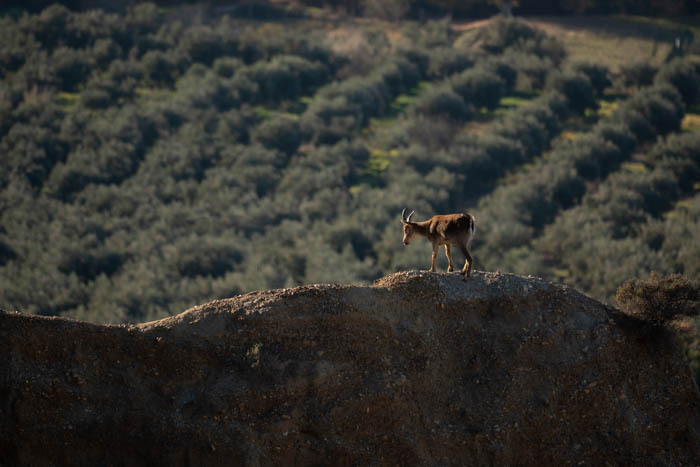 Ibex on the cliff edge with the sea behind it. More often then not they end up on the edge but with another cliff in the background. I get lucky a few times and manage some nice images with and without the sea in the background. It is, as so often, a question of being patient! 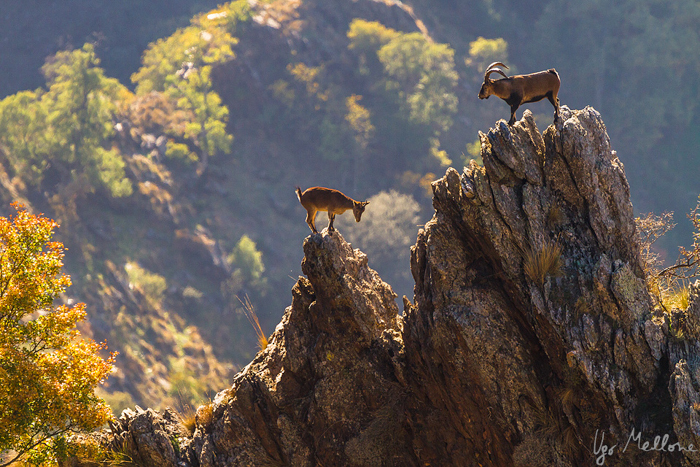 Ibex on the cliffs or on the rocks? Around 11 o’clock we call it a day . It is hot (25 degrees) and Ugo suggests to head back to Granada and try our luck in the Sierra Nevada. It is really funny to see Christmas trees here! Must be because of the hot and sunny weather! After an hour we head up to the Sierra Nevada. A mountain range and ski resort. Snow is already on the peaks and the ski lifts are open! In 30 minutes we drove from sea level up to 2500 meters and end up in the snow! First stop: lunch. A quick sandwich and a coffee! We drive down the mountain a bit. Ibex generally will be under the snow line looking for food. We park the car after a short drive and see a few Ibex resting. Ugo suggest we walk up. Given the fact we are at 2500 meters, oxygen levels are much lower and I find it quite a struggle to go up a rather steep and slippery slope. When we get close to Ibex we notice that the most beautiful male of the group has a radio collar….not the kind of picture I had in mind. We decide to try another mountain road. Ibex might be relatively easy to photograph but they blend in well and are often difficult to spot. They are approachable but, trust me, they will run when you get too close! We park the car again and the terrain is a bit easier to move around. Ugo spots a few Ibex in the far distance but not much else shows up. 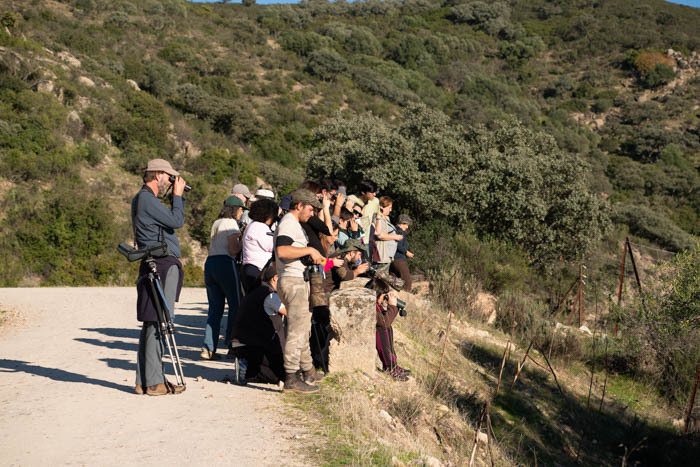 We walk back to the car when Ugo spots a fairly large group Ibex. 3 males, a few females and young ones. We sit down and are able to take some images but they are rather wary and move away in another direction. Near the car we spot another group close to the road. Using the road barrier as cover, we get close to them and I am able to get some nice images before they move into the forest. We drive down the mountain road and see another group. Park up and with the 100-400 mounted on the A9 I get some nice images but again the Ibex are rather shy and move away into the shade. By this time the light is slowly fading , so we decide to head back to Monachil. We reach the Petrol station around 18.00. Tomorrow we are back in the Sierra Nevada and in the afternoon we are trying a more desert like setting for the Ibex. A decent day with not an awful lot of images. But then: it’s not about quantity but about quality…he says with a smile on his face! Off to the Sierra Nevada this morning in search of more Ibex. Glorious day again and the twisty road leading to the Sierra Nevada is very busy early this morning. It’s a bank holiday in Spain so everyone is hitting the mountains for a bit of skiing. We decide to stop half way to the top for some breakfast and a coffee. We decide to take another route up the mountain. There is no traffic and on this road we found (yesterday) most Ibex. Our first encounter is with 2 Red squirrels, chasing each other around a couple of fir trees. Still too dark to get any kind of decent images…besides the squirrels are simply too fast! We scan the roads and rocks but no Ibex to be seen. If anyone thinks photographing is a piece of cake: you are mistaken! The area is vast and the Ibex move around a lot but if you manage to find them, you still need to approach them slowly and carefully! They will run. Close to the top (2500 meters) we spot a group of Ibex feeding besides the road. I take some images from the convenience of the car but the herd decide to move up higher on the hill. Ugo suggests to park the car and walk back over the ridge. We walk back but no sign of the herd. We spot a massive male Ibex far away on a ridge but it is too far away to stalk it. Back in the car we decide to drive back to the place where we saw a group yesterday late and much to our surprise we found them in exactly the same place. Mainly youngsters and females but they give us some good opportunities to take images. 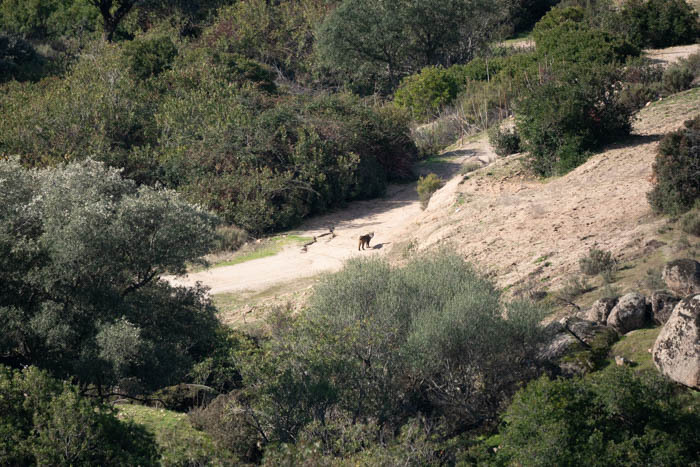 Slowly the Ibex disappear in the forest. On the other side of the valley, we spot another group coming down rapidly chased by a large male. We can hear a battle erupting in the wood! Horns collade! But no images unfortunately. By now the light is hard and we decide to make our way to Depresion de Guadix. It is a good hour’s drive over twisty roads and before we get to these cliffs, we stop for a brief lunch. 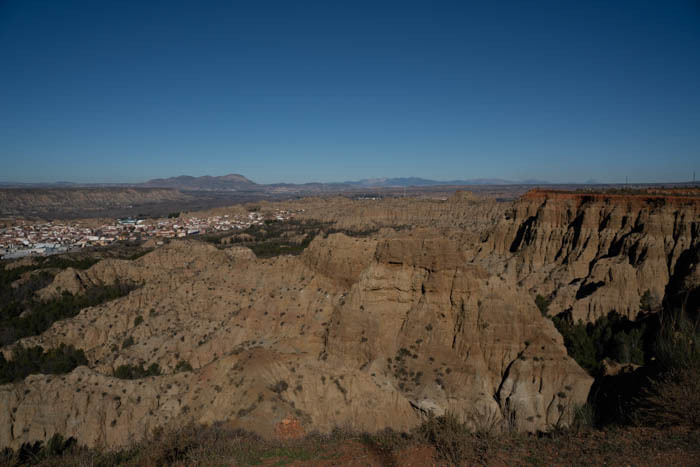 Depresion de Guadix are cliffs. It used to be a lake, which many zillion years ago drained, leaving these massive cliffs. 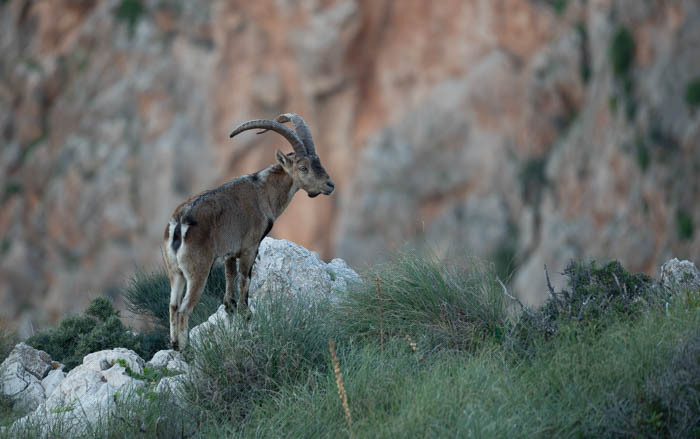 The cliffs are the perfect habitat for the Ibex. Depresion de Guadix…trust me…it is steep! A dirt track leads to the cliffs and after a short drive we park the car and soon we spot some Ibex but unfortunately too far away. We make ourselves comfortable and wait for the light to improve. We see another group on a ridge and they allows for some nice images. The group exists out of adults and a few youngsters. It is amazing that these animals are able to move around on these cliffs. 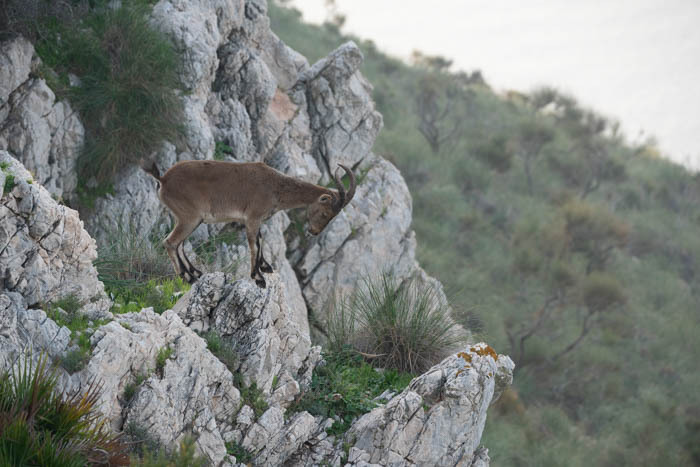 One hoof in the wrong place and the Ibex will fall vertically for at least 50 meters. Later on we find a few large male Ibex chasing a few females. Unfortunately they are just below a ridge in the shadow and often obscured by some vegetation. Eventually they move out in the open and move along the ridge. Even though they are in the shade I manage to get some nice images. It is amazing to see these mammals not loose their footing! By this time the light is fading. We pack it all in and after a good hours drive I am bank in Monachil. Tomorrow morning we will be heading for the cliffs near Nerja again. After that we will drive on to Andujar for the second part of the trip: Lynx! This diary input will be rather brief! Not an awful lot happened today. 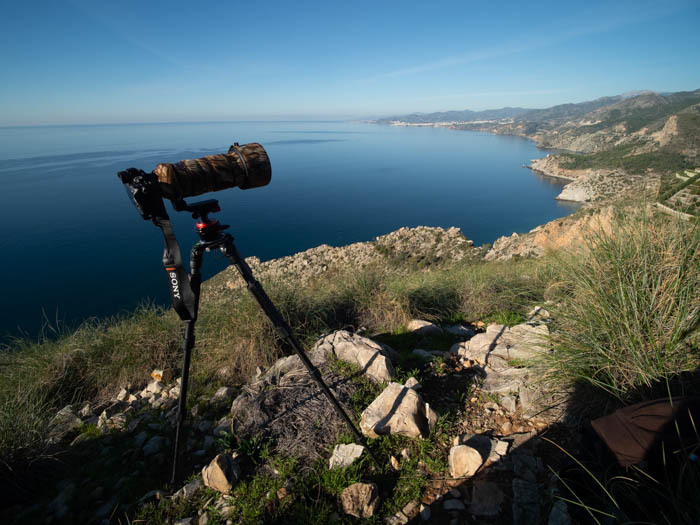 I left the hotel early this morning and Ugo suggested to go back to the coast near Nerja to try for the Ibex on the seaside cliffs one more time before driving to Andujar for the Lynx. 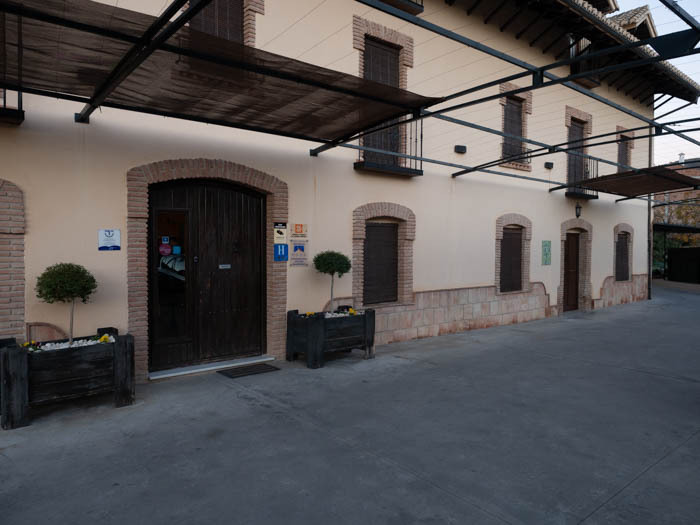 The hotel in Monachil was ok. Food was actually rather disappointing and for that reason, if I go back again to this area of Spain, I will definitely stay somewhere else. After all: it is also a bit of holiday! After a good hour’s drive we reached our destination, only to be greeted by fog! We made our way to the top from where we have a good overview of the cliffs but the Ibex had other plans today, as they were all feeding in the shallow valley below us. A few large males and females were grazing peacefully. I moved a bit lower from the top. Care must be taken here, especially those with heavy and ancient DSLR equipment…. the rocks make moving around a bit dangerous and you do not want to drop your expensive kit on granite rocks! I spotted a nice male on a rock just in front of me and he allowed me just enough time to take some nice images with and without the sea in the background! We waited a bit longer but nothing much happened. By 11 we decided to make our way back to Granada and from there we would drive onwards to Andujar, which would take another 2 hours. Around 15.oo we arrived at Andujar. December is THE month to see Lynx. The Lynx is the most endangered cat in the world and in Sapin there are no more then around 500 individuals. Andujar is one of the strongholds for Lynx. Their main prey is rabbit and to-date they can find plenty of these bunnies near Andujar. December is the mating season for the Lynx, so there is generally a lot of activity. I recall that in this area alone there are around 20 individuals. The area is fast. It is a hunting area and there are fenches everywhere! Yiou are NOT allowed to go into the terrain and all observations of Lynx are made from the dirt road that passes through the hunting estate. Now the good thing is: there are a lot of people on the estate with binoculars, scopes and a number of idiots with large lenses. So once a Lynx is spotted …everyone will know in no time! So off we went and indeed: in no time we found a Lynx! Surrounded by a large crowd a young Lynx was sleeping/hiding under a tree and some shrubs. Well camouflaged and very difficult to spot and close to the dirt track as well. Once spotted Lynx are not very shy. I know that there are hides to photograph Lynx but it really isn’t necessary to sit in a hide, for god knows how long, to get some images of Lynx…if you are lucky. Moving around gives better opportunities but of course you still need a lot of luck! However: we waited and waited and waited for the Lynx to come out of cover but he or she stayed put! Long after sunset we gave up and drove back to our accommodation, checked in, dropped our stuff and headed for the bar. There we heard that the Lynx DID move out….but in almost complete darkness. Tomorrow a new day with new chances! On the road by 8 and it is another gorgeous morning. Pretty cold and fog is cover the valley and hills on the estate. We soon reach our vantage point, very close to where we were yesterday afternoon. Put the tripod up and I make myself comfortable in my little chair. Hopefully the Lynx will show up. So let me tell you a secret: photographing Lynx isn’t easy. Whether you are stuck in a hide or stuck on a little chair on a dirt road. The keyword here is : killing time! And killing even more time! More often then not: nothing happens! It is the same story this morning. Nothing shows for an awfully long time. 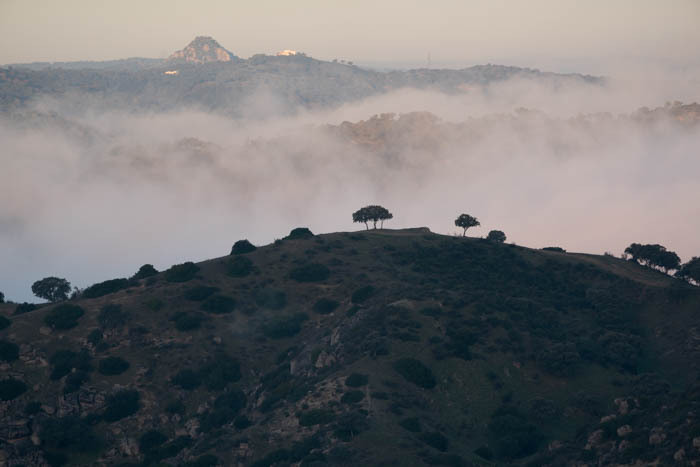 I take some pictures of the hills shrouded in mist…that’s about all I do! Some vultures and a Imperial eagle fly overhead but as it is close to winter not many birds are around. Red deer in abundance: after all it is a hunting estate! It must be around lunch time that all of a sudden the Magpies start to make an awful lot of noise. The birds are at least 600 meters away. Often the Magpies sound the alarm when a lynx is in the vicinity and that’s what is the case that very moment! A lynx shows on a dirt track for a couple of seconds before disappearing in the surrounding shrubs. Yes it is full frame lynx! Through telescopes we can see the Lynx lying down. Sleeping, preening, sleeping, preening. This goes on all afternoon. A typical cat: lazy! Later on in the afternoon the lynx starts to walk off and as the light is now coming straight at us, the whole group decides to move further up the road, hoping the lynx might show up at some stage closer to the road! Luck is with us! We spot the lynx but as the group is so large, and some people are so loud, the lynx decides to move in the undergrowth. We keep a close eye and on a number of occasions it shows briefly. The light isn’t great either but in these situations you do not have much choice as you are NOT allowed to get off the dirt track, so every opportunity you get to take a shot, you take! Around 17.00 in the afternoon the lynx is spotted again: close by the road. We finally get some (sort of) decent images of the cat lying down for a few minutes, before getting up, stretching and off it goes again. I do get some mages but wall hangers they are not…more a record shot but at least I have something! This is the moment I end up in a massive argument with a silly English photographer who decided to walk back where the lynx supposed to be. Some of the Spanish experts ask him to stop (in Spanish) so I call out and ask him to wait! (in English) Reason being: the lynx likely wants to cross the dirt track and with a photographer so close it might stress out the animal, stopping it from crossing. The guy clearly didn’t get it and starts to get really angry with me. Not very considerate: it is not always about the picture! Anyway that was the end of the day. Clearly this kind of photography is completely different from what I normally do. I take far less pictures on this trip and there is a lot of waiting around. Nevertheless it is great NOT to be in a hide for once! Tomorrow we will do the same stretch of track again. Hopefully I can get some good images of the lynx in good light! It is Tuesday morning the 11th of December when I am writing this. Wondering why there were no updates? Well there was nothing to update about unfortunately! On Sunday we executed the same drill. Up into the estate before sunrise, driving toward the same position on the dirt track that gave the best overview and which was also the spot where the lynx was spotted most often. Surprisingly far less photographers and spotters today. In one way it was a blessing, on the other hand it meant less eyes to keep watch on any lynx movement. so from around 8 till 6 I was more or less stationary and I can honestly say: it was becoming increasingly boring, I am used to release a shutter button not preening my eyes on something invisible! Of course I do understand that, especially with an elusive cat like the lynx, you need to be patient. They are there! But the area is so vast: it could appear anywhere. Bottom line was that by 6 in the evening, when dusk falls over the valley, we headed back to Los Pinos for some beverages, diner and a bottle of wine. No lynx, no photo’s. Ugo suggested that on Monday we should visit the picnic area. A place where different lynx territories come together, so maybe a better opportunity. Next Morning out and about to the picnic area. A shorter drive as well. Driving around put holes on a dirt track is rather tiring although this road is not much better! We arrive at the spot and meet up with Ivan Ruiz, a photographer from Madrid, who spent the night in his car. Along the picnic area is a dam and a small stream and pond. It looks really nice and fog hangs over the small pond. It is freezing cold! I see 2 otters in the water but too far away. We do position ourselves on the rocks in anticipation of the otters to return: which, of course, they do not do! We decide to look around for any lynx signings but nothing shows up at all! It is a good place for Azue winged magpies, Black redstart and other small passerines. I decide to have a nap in the car while Ugo keeps on looking around but clearly the lynx have other plans. 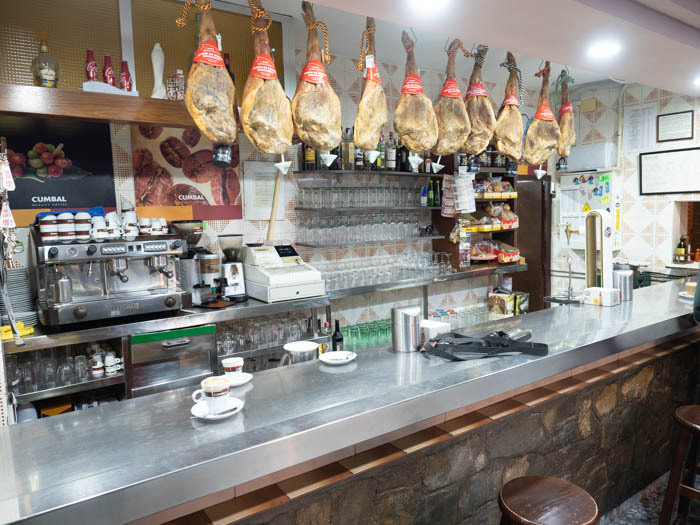 By midday I suggest we head back to Los Pinos for a sandwich. With the bank holiday over Los Pinos is much quieter as well. After lunch we decide to head back to the vantage point that we have been using most of the time and where we did manage to see lynx on 3 occasions. We meet up with the Italian couple again. They DID see a lynx very early in the morning for 5 seconds before it disappeared. We exchange mobile numbers and we head up a bit further on the road. We stay again till dusk but no lynx anywhere. We meet up with Elena and Maria who were at a Bat congress in Gibraltar and are on their way back to Madrid. They had decided to stop and try for the lynx as well. By 6 we decide to head back to the hotel. I have now decided NOT to go out again in the morning but instead finish writing my diary, have a coffee and relax a bit! Later that evening in the hotel bar I run into Carlos, the owner of Photologistics. It was really a surprise to see him here. He was inspecting some new hides for nature photographers in the area. Who knows? Maybe next time….. So my trip is done and dusted. Flying back with Easyjet later this afternoon. 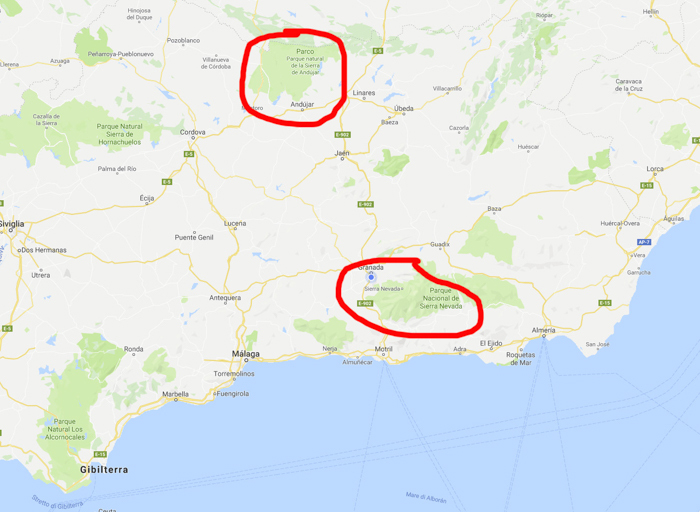 Driving back to Granada takes roughly 2 hours. So what did I think of the trip? Would I do it again? I wanted to photograph Ibex, which I did in various settings but I feel I could have done better if the Ibex were more cooperative. The Ibex in the Sierra Nevada were, in my opinion, difficult to get to. Photographing them on the coast was special but difficult as you are photographing down on them a bit. Lynx: I think I pass on lynx for a while. I think 2 1/2 days is TOO short for photographing them. You need an awful amount of luck, but it is the same with trying and photographing them from a hide! I was lucky to see them on 3 occasions and have a few (nothing special) images to boot. The landscape is beautiful and as I have never been to this part of Spain I would definitely return one day but I am pretty sure I give lynx a miss! Ibex would like to do them again but perhaps in another region of Spain. Any suggestions welcome! I organized this trip direct with Ugo Mellone. Ugo is a pro nature photographer living in Granada. Ugo thanks for everything! It was very enjoyable despite the lynx not playing ball! Cost for the trip was around EURO 1000, excluding flight with Easyjet, which worked out at £125 return from Gatwick and car rental from OKcars, which worked out at £125 for the week. Hotel accommodation in Monachil , for first part of the trip, was ok, food pretty bad. Can not recommend unfortunately. Second part of the trip I stayed in Los Pinos. Clean, small apartment, good food and best location for access to the hunting estate where lynx can be (should be) found. Weather was ,throughout, exceptionally warm topping at 25 degrees on the coast. It was sunny every day . 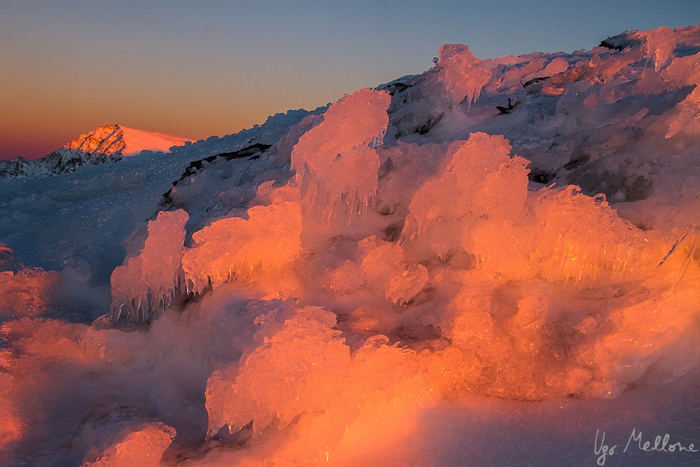 It can be very cold in Adjunar early morning. Roads are good but the dirt track on the estate has some deep put holes but overall not a real issue. 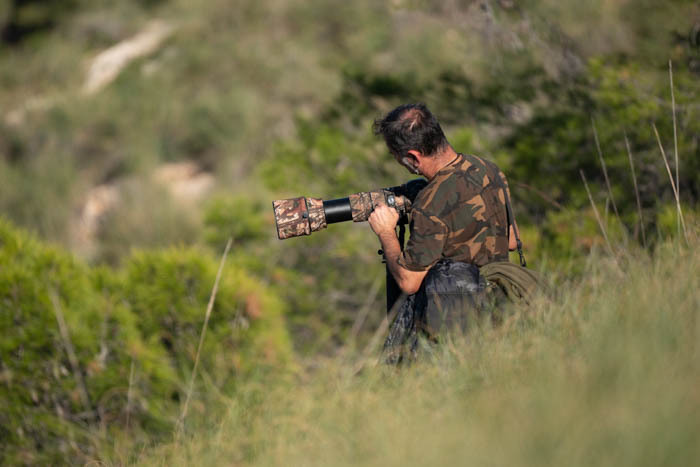 Cameras and lenses: for the Ibex I mainly used the 100-400 and for lynx the 60-600. For the latter: the more mm the better. So that’s it for me. Overall a disappointing trip but that’s the life of a wildlife and bird photographer at times. You have good days and lesser good days. January I will be back in Spain! A revisit to Turia hides near Valencia. I wish you all a very good Christmas! Sounds you will have a great trip. Wish you a great time and lots of great pics. Fascinating diary Rene. I do hope that you can get a chance viewing of the Lynx and I remember the paradox of a temperature in the 20’s, yet snow. Andalusia is a magical place, enjoy every nanosecond : that includes the food and wine, to my mind, the best in Europe. Thanks Mike, nice of you to read the diaries! I can honestly say that a lot of time go into them. Just back, been outside since 7 this morning and now doing my update! Super write up well thought out and clear about what’s around you even managing to get a piece of cake involved all been a fan of your images. Best wishes for the rest of your trip. I’m quite bussy at the moment but will follow your adventures! leest weer lekker weg Rene! Breathtaking photos, found the one with the mist over the hills wonderfully atmospheric. It encapsulates early morning in the Sierra. I’m really pleased, as I bet you are, that you actually captured a good pic of the lynx. Hopefully, you’ll get plenty more Rene. As for the stupid English photographer : I’m just going to quote my darling Dutch sister in law ‘the English are on an island for a reason’. Enjoy the rest of your trip. Off to peaceful Venlo today, but will be posting as per. Congrat for the Lynx It is not easy see it that close in your first visit! 🙂 and thanks for trying to stop that photographer, photography is nothing if the animal is not confortable. Good luck for next day! An argument with another photographer?! And there was I thinking it was a civilised, gentle hobby…….. So glad you got to see the lynxes. I hope it’s proving to be a good week, as you say, not your usual trip but nice to be out of a hide. Lovely photos Rene! And good reading. Looking forward to more photos and story! Rene, glad you had a glimpse of a lynx an saw Ibex and otters(such delightful creatures, it’s hard not to get anthropomorphic). Hope being back in the UK isn’t too much of a shock. Feliz Navidad a todos! An enjoyable read Rene, as you say, there are no guarantees in nature photography! You could try the Sierra de Gredos mountains for Ibex, Ian and me were there in April 2010 and as I remember, we had some Ibex that were pretty close. The reason we didn’t get photo’s is because the weather was bad, low cloud and mist. I would think it’s a good place to photograph Ibex if you had good weather.